We've got confirmation on that secret Donald Glover / Rihanna movie. We first heard word that the two prolific musicians and actors were going to be working together on a project back in August, which was being shot in secret. The secret kind of got out, but virtually no details were revealed. Now, Glover has revealed the first trailer for the movie at his own Pharos festival, which took place in New Zealand over the weekend. The movie is officially titled Guava Island and, unfortunately, the trailer wasn't released by Donald Glover or anyone involved with the project. Instead, someone attending the festival uploaded some shaky, but clear enough footage of the trailer to Twitter. Hopefully, someone will upload the actual trailer sooner rather than later, but for the time being, this will have to do. At the very least, we now know that this secret project is indeed a full movie and not just a music video. Beyond that, many of the details remain mysterious. But Glover is an artist of a unique sort and an undeniably huge talent. Couple him with Rihanna and Guava Island, whatever it ends up being, becomes instantly appealing. As for the trailer itself, we see Donald Glover and Rihanna are a couple living a seemingly idealistic island lifestyle. However, the burdens of day to day life get in the way of them actually being able to enjoy it. "We live in paradise but none of us actually have the time or the means to live here," Glover says in the video. 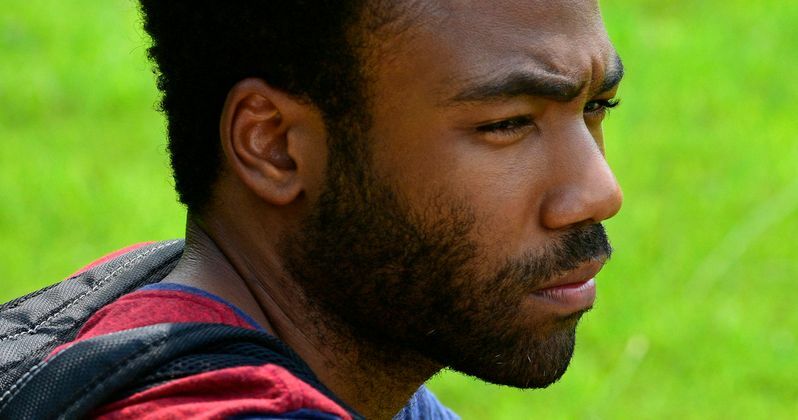 The movie is also credited as a "Childish Gambino film," while also listing Glover as a cast member separately. This is particularly interesting because Glover's forthcoming album and the tour he's finishing up are set to be his last as his musical alter ego. Black Panther star Letitia Wright and Game of Thrones veteran Nonso Anozie are also listed as cast members. Hiro Murai, a longtime collaborator of Donald Glover's, directs Guava Island. He previously worked on Glover's hit FX series Atlanta, in addition to directing the video for This Is America, which made massive waves when it was released earlier this year, as well as the video for Sober. For the time being, that's about all that has been revealed. There is no official synopsis for the movie, nor is it clear when it's going to be released. For that matter, it's not at all clear what platform this is being made for, be it intended as a theatrical release or something being made for a streaming service. Or perhaps Donald Glover will just release it on YouTube. At this point, all anyone can do is speculate. Either way, we're getting a movie with Donald Glover and Rihanna at some point in the relatively near future, which should make a rather large section of the internet very happy. Be sure to check out the trailer for Guava Island from purelylorde's Twitter account below. Once a better version of the trailer is officially released, we'll be sure to bring that you're way. Are Donald Glover and Rihanna Shooting a Secret Movie in Cuba?